Post subject: Can it be faster? 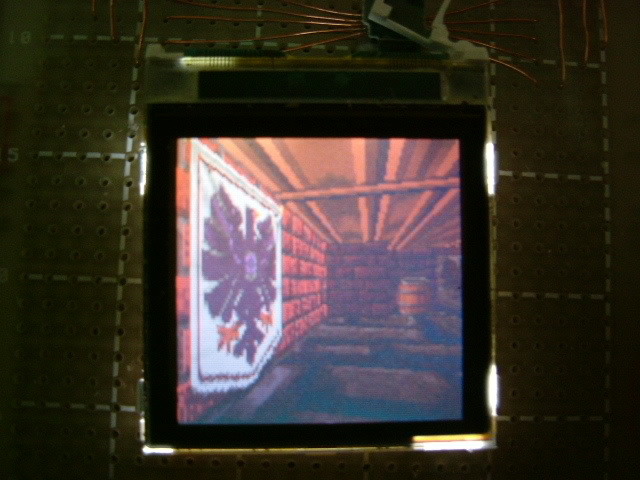 I got this Display to work with a PSoC at 24MHz. I would like to plot some real time lines, but it seems too slow! ItÂ´s taking about 128ms for each line plotting. Do you know if this display can plot faster with this processor? Today I am using PASET, CASET and then the RAMWR commands to plot each pixel of my lines. it should be a Philips one with a GREEN PCB on the back. I've tried drivers for both controllers with an ATMega8, but none of them worked. (HW and LCD pinouts seem to be ok). // Copyright:	Free to use at will & at own risk. // Copyright: Free to use at will & at own risk. // We make use of 8 axes of symmetry in a circle. // This way we have fewer points to calculate on its circumference. // This is the most important part of the function. // We go to the right in all cases (x++). // We need to decide whether to go down (y--). // closest to the path of the circle. // Good old Pythagoras will tell us what to do. Hi guys, and galls ?? I've ordered a Sparkfun Nokia 6100 breakout board. I'm not a total newbie. Here's one of my previous 'projects'. 1> Has anyone got a 6100 lcd working via pure MPLAB asm ? or will I need an extra power supply for the PIC ? 3> If I run the PIC at 5-6V, can I interface it directly with the LCD thats connected to a 3.3V supply. Or would I need a voltage converter board between the lines ? The posts I've read here make it seem like everybody is having no trouble at all getting the screen to do things- I can't even seem to get it to come on. My first attempt was to connect this to the 18F66J10 from Microchip. The Reset, DIO, SCK, and CS lines are connected to PORTD pins on the 66J10. The 3.3V line goes into regulated voltage and I attach the Vbatt line to 6 - 7.5V (in my experiments I've varied how I source this voltage). Since the 18F66J10 has 8-bit SPI only, I had to write a bit-bang routine for 9-bit SPI. Since there are no connections to receive data from the screen, I can look at my SPI output on the o'scope and my transmissions look correct but I can't be sure the screen likes them. I follow the recommended Reset process and then I send all the Epson initialization commands mentioned in the tutorial document (including all the additional delays specified by that document). Afterwards I send the PASET/CASET/RAMWR values with values I expect to produce a red color, but the screen has no change. In fact, once power is applied to the screen the appearance never changes at all. After sending all the commands in the tutorial, I would expect at least something to happen on the screen. Just in case my SPI is at fault, I then attached the screen to the ColdFire M52233 demo board, which gives me 9-bit hardware SPI. But I get the same results here, after following the steps from the tutorial, the screen has no changes in appearance. Something else that is odd, on the Sparkfun schematic for their board, the Vbatt line goes to a voltage-boosting circuit and then connects to the Vled line on the screen. However, if I don't source this line, then the whole screen goes black just as when it has no power at all. Sparkfun's website gives examples of attaching up to 6V to the Vbatt line, but if this somehow ties into the main voltage lines for the display, then maybe the Vbatt line should not be used on voltages over 3.3V? This whole process has been very confusing. If anybody (especially people using PICs) can explain exactly how they wired up the screen to get it to work it might help me. It really frustrates me that the Slave-Out SPI lines are unimplemented since there is no way to check if the commands being sent are even getting through. Are you sure that the LCD you have is indeed using the Epson controller? I bought the breakout board with included LCD from SparkFun just a few weeks ago and it turned out it was using the Phillips controller. I'm going to post a question of my own beneath here and I'm including the initialization code that worked for me (it's a horrible cut and paste job from several different code snippets and tutorials that finally made it wake up. I'm not even sure I need half of the stuff to be honest). After a couple of weeks of on and off trying to get this to work I'm turning to you guys to put me out of my misery. I'm trying to use the display in 4096 colour mode sending the colour in this format to the display "0000RRRR GGGGBBBB" as shown here. However, it seems that my display is receiving data in a RBG order rather than the more sane RGB order. In the pic below I'm drawing a box of Red, Green and Blue however, it is showing Red, Blue, Green. By reversing the last byte of the colour it seems to display normally (see code at the end of the post). I guess I could live with that for simple stuff. However, when trying to display a picture this doesn't seem to work out. At the top of the image you'll see 8 strips of random junk which should actually be displaying the colours of the rainbow (you can see the blurry original on my computer above the LCD). I'm using the program found here to convert the 24bit BMP that I created as a test. I'm telling the program to spit the data out in its "12bit B" format which looks like this "XXXXRRRR GGGGBBBB". The 8 strips of garbled coloured dots represent me sending the data from the program in different ways. Top to bottom and non reversed, one byte reversed, last reversed and finally all reversed. Nothing seems to do the trick. The colours are also very washed out (tweaking the contrast doesn't do much more than either blowing them completely or making the screen darker than is useful while still having washed out colours). Functions for defining "window" size and filling said "window"
Also as a side note, the really annoying high pitched whine from the SparkFun breakout board is normal, right? I have been having trouble powering up my LCD, I'm unsure which controler is inside and as such have taken two programs that should work and modified/hacked them up to output over the parallel port on my computer. This has proven unsucessfull and I am unsure what to do next, I have tested the circuit I built and everything seems to be working correctly. Can anyone here have a look over the code or advise on how to get it turning on over parallel? Thankyou very much in advance. I'm using MPLAB asm code for a Phillips controller. depending on the value I send it. If anyone wants my code, let me know. Last edited by taximania on Fri Sep 26, 2008 19:30, edited 1 time in total. And has a small red circle around the "BD" part. Front has a yellow tab. Can you identify it by the markings (or anyone have anyhting similar)? Are there any chances of graphics controller getting damaged ? ?